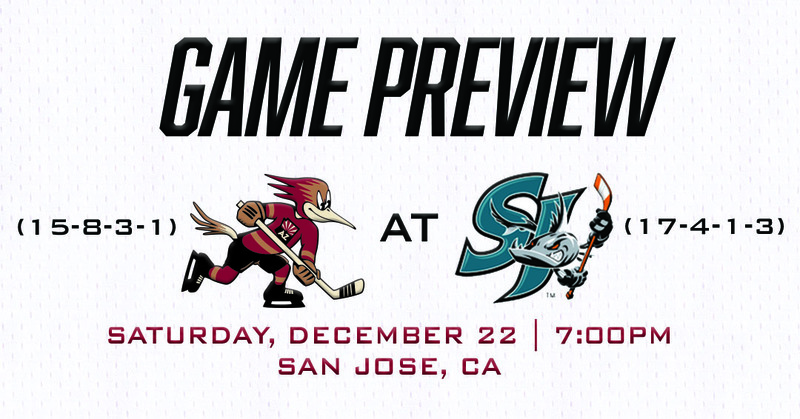 Tonight, the Roadrunners make their third visit to San Jose’s SAP Center to play the fifth of eight scheduled games against the Barracuda this season. 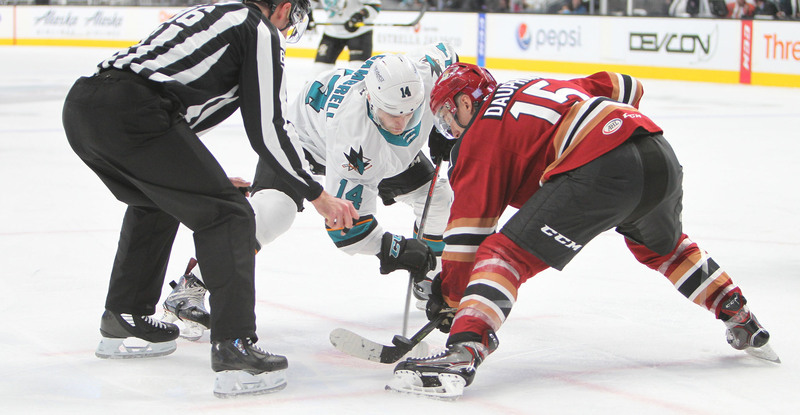 With last night’s 4-3 overtime loss, Tucson has now claimed six of a possible eight points in its four games played against San Jose this season. Friday’s game snapped a run of three-straight regulation losses for the Roadrunners. Despite being only four points out of first-place in the Pacific Division, the Roadrunners certainly have some company on the back-end as well; the Colorado Eagles (32) and Bakersfield Condors (30) sit just two and four points behind the Roadrunners in the standings respectively. Colorado and Bakersfield meet tonight; the Condors beat the Eagles by a 5-3 count last night. With his assist on Jordan Gross' goal last night, Laurent Dauphin is now just two points shy for 100 in his AHL career. He enters the night with 98 (43G, 55A) in 185 league games played. 59 of those points (27G, 32A) have been registered during his 82-career games played in a Roadrunners uniform. Road reds, for one more night at least! Tonight will be the final time this season that the Roadrunners wear their red jerseys on the road, barring any future requests from home teams. After the Christmas break, the Roadrunners, like the rest of the AHL, will wear dark uniform sets (red) at home and light uniform sets (white) on the road. The Roadrunners, due to the Stockton Heat’s travel schedule, will wear white for the next two home games, December 28 and 29, before fully abiding to the league-wide switch. FASCHING UP: With his wrap-around tally 12 seconds into the second period last night, which is now the fastest goal to begin a period in franchise history, Hudson Fasching became the Roadrunners’ current leading scorer in registering his ninth goal of the campaign. Fasching, who has found the back of the net in each of the Roadrunners’ last two meetings with the Barracuda, is well on pace to shatter his career-highs in goals (12) and points (30), which he set in 69 games with the Rochester Americans last season. STRONG AT SAP: The Barracuda have been virtually unbeatable on home ice this season, entering the night with a 9-1-0-1 mark through 11 games played in San Jose; they’re tied with the Syracuse Crunch for the fewest home dates played thus far in the AHL. The Barracuda’s .864 win percentage on home ice is the best mark in the entire league. SHUTOUT SPECIALIST: Due to the back-to-back nature feeding into tonight’s rematch, Merrick Madsen is likely to get the start, which will serve as his ninth of the season. Madsen shutout the Barracuda on consecutive nights on November 9 & 10, making a combined 47 saves. Magnificent on home ice to begin the season, Madsen is still without a win on the road; he is 0-2-0 in three starts away from Tucson Arena this year. EIGHTY: The Roadrunners have registered the first goal in 15 of their 27 games played thus far, including Friday night, and with a 9-3-3-0 record when doing so, they have earned points in 80% of those games.